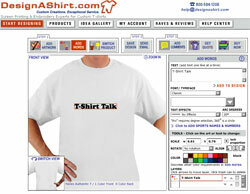 Here are some of the companies that have tools to empower customers and designers to create their own custom t-shirt. 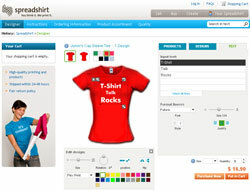 Spreadshirt is one of the most popular places to create your own t-shirt. 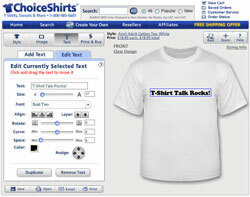 CustomInk has a powerful and easy to use custom t-shirt designer tool. Create one or order in bulk and choose templates from their idea gallery or design your own with a nice selection of fonts and art. 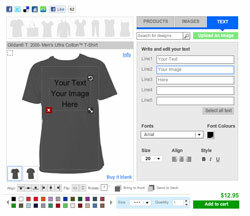 Since the tool is built in Html5 you can even design a t-shirt on your iPad or iPhone. Choice Shirts probably has the best custom t-shirt designer out there. Its attractive, powerful and easy to use. Fibers.com is a new kid on the block had has one of the most feature rich designer tools out there. You can even create a distressed looking shirt or draw directly on your shirt. Wordans.com has a tool similar to Spreadshirt and it is pretty good. Pretty straigtfoward and simple to use. 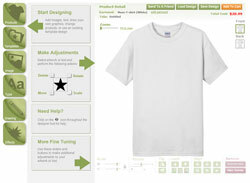 Zazzle has a really nice and flexible product designer to create your own custom t-shirt. Quite a few options to get exactly the design you want. Customized Girl is one of those sites you always see in US Weekly and is definitely geared towards women. Create your own “girl” t-shirt at Customized Girl. Can’t get quite as customized as those listed above but fairly easy to use. 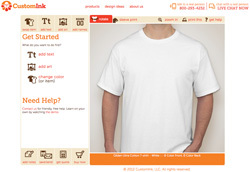 Design A Shirt has a custom t-shirt designer with what appears to be a lot of options but its still pretty simple to create a custom t-shirt. 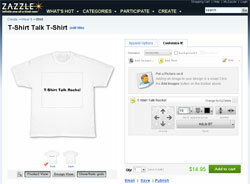 Cafepress has a new design too based on SVG so it is easy to add simple shapes and text. IT has a great full screen view. 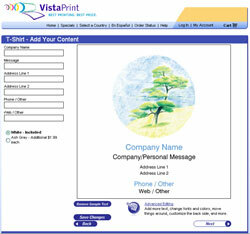 Vista Print isn’t great for creating “very” custom shirts, but for people who are shy of technology they make you go through steps page by page rather than just giving you a product designer in hopes of making it easier (but much less powerful). The template choices are clipartish and so-so and our least favorite place for custom shirts.